Today, in order to celebrate March 1st (Springtime is near! 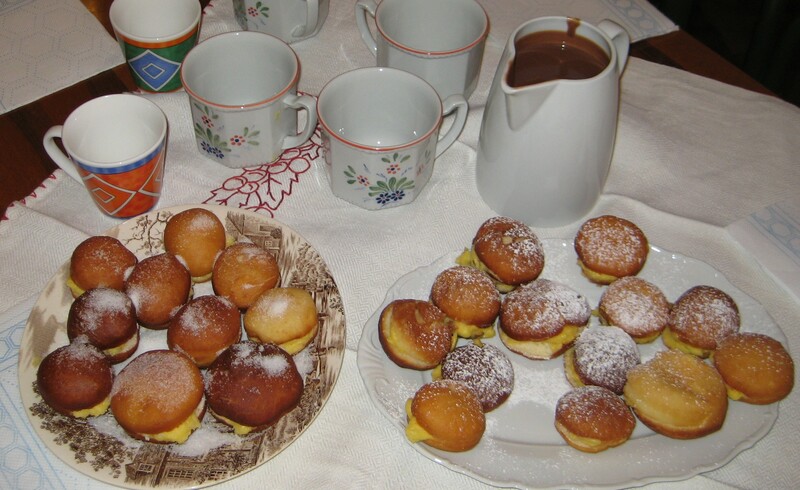 ), I would like to share our (secret) bomboloni family recipe to my (more than one and less than a hundred) faithful readers. After mixing all the ingredients (add the milk in the end, little by little, in order to have a “good-looking” mix – what is a “good-looking mix?” – don’t ask – just part of the “family recipe secret”! ), put the mix into a terrine until it rises and doubles its original size (my mother usually covers the mix with a clean dishcloth and places the terrine upon the stove after heating the oven below and leaving the oven door open – 1st family secret!). This step usually takes about an hour. Then roll out the mix with a rolling pin and make it about 2 or 3 cm high. Take a round-shaped glass, make disks out of the mixture and have them rise again until they double their original size. Now, you are ready to fry them into a pan (filled with sunflower oil – a lot of it – the more oil you put in the pan, the lighter the “bomboloni” will be). Make sure that, at first, the temperature of the oil is very high; however, after placing the bomboloni into the pan, you had better lower the flame underneath (2nd family secret!). Then take the bomboloni out of the pan using a skimmer and place them on a tray where you have previously placed absorbing paper (Scottex-like): 3rd family secret! 3 eggs (just the egg yolks) – 3 spoons of sugar – 1 spoon 1/2 of flour – vanilla essence – lemon peels (3 or 4 pieces) – 3/4 of a glass of milk. Make the “zabaione” mixing the eggs, the sugar and the flour. Then turn on the fire under the pan and start adding warm (4th family secret!) milk until it thickens. In the end add the vanilla essence and the lemon peels. Last but one step: fill the bomboloni with cream and sparkle them with icing sugar. Last step: gobble up as many bomboloni as you can. Previous Mais où sont les neiges d’antan? Next A very merry un-birthday to you… Gioachino!